As you browse online, you’ll find many tips and secrets when it comes to cleaning hardwood floors. We often get confused as to which one will work. 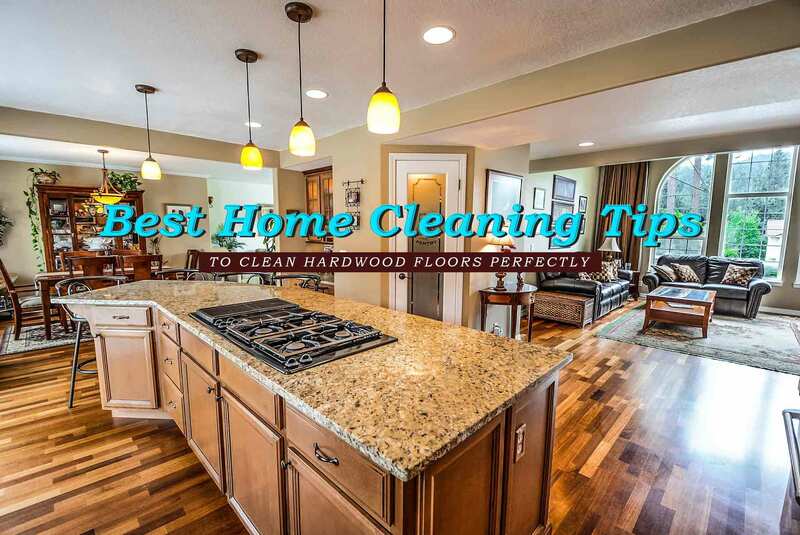 Well, in this post you’ll learn the best home cleaning tips to clean hardwood floors perfectly. Yes, there are things that you need to know in order for you to get the best results. So, let’s start! Try to vacuum at least once a week. Because if you don’t, the grit and dust you track in from the outside will eventually wear through the hardwood floor finish. Also, you need to take into account that when you are vacuuming the floor, make sure to avoid using a vacuum with rotating brushes as it may scratch the surface. Considering that you are using an upright vacuum, make sure to remove the beater bar to preserve your floor finish. And if you don’t have time to do the cleaning yourself, the best thing you could do is to hire a professional reliable cleaner that will do the work perfectly. Another best home cleaning tip that you could do to have a clean floor is to make sure to have rugs. Put them in all your so-called high-traffic zones of your house like the living room, main entrance, and doorways. Putting rugs in an area where people most likely to walk around could make an efficient house cleaning strategy to maintain the good look of your hardwood floors. Also, try to educate yourself about waxes. Don’t just use wax because you like the look or smell. Bear in mind to use the appropriate wax for your floorings. And watch out for highly recommended ones for they might not be suitable for your surfaces. Make time to know all these points before you do the cleaning. Also, don’t forget to use a microfiber mop. In this way, you could avoid leaving excess water on the floor that could cause damage to your floor. And now you already have the idea about what you can use and what to avoid. So, it’s now time to get into the best home cleaning tips to clean hardwood floors. As what have known, the best way to clean any surfaces in your house is to dust it before applying water. If you are going to go straight to mop your hardwood floor or wax it, what you could find is a piece of grit and dirt swimming in your attempt to clean. Sweeping your so-called high-traffic zones before mopping is incredibly essential. Yes, areas like hallways and dining rooms will need extra attention. You can vacuum the floor instead of sweeping but make sure to do the dusting first. It might be a tiny excessive, but this is the best way to prepare your hardwood floor for the clean-up. For an excellent result, make sure to use microfiber duster in dusting it. And before you do it, make sure you save the floor for last. Remember, when doing the best home cleaning, complete dusting from top to the bottom. Additionally, one great technique when dusting your hardwood floor to prevent confusion is to divide the room into sections. By doing so could help you keep on track of the work you have done. When cleaning it, one best home cleaning advice is to avoid soaking it. Yes, soaking the floor may seem harmless. However, excessive water could affect the finish of your floor. So, when you are using sprays to clean it, make sure you use a fine mist. Thus, clean your floor in sections for the best results. Well, some people may like to use certain cleaning products like all-purpose cleaners and white vinegar on their floors. Those products are fine but don’t feel that you have to do the same. Warm soapy water can work just as well. Just make sure that the spray bottle used has an adjustment to avoid putting too much liquid on the floor. Knowing the right way to mop a hardwood floor is essential knowledge to have. You might think that you just have to grab a mop, a bucket, and begin. Well, that is not the case and it’s not that simple. There are certain things you need to take into consideration. For example, make sure that the mop is not wet and instead it should be humid. Also, when mopping your hardwood floor, you can’t just go in any direction. Instead, follow the grain of the wood. Squeeze the mop dry and go over the floor once again to get rid of any unwanted bands. Trying these best home cleaning tips will make your life a lot easier for this task. However, if you could not find the time to do it yourself, the best option you could do is to look for professional cleaning services. They will be more than willing and happy to serve you. Looking for local cleaning services? Well, you’re on the right track! Maid in Perth is right for you. Offering a variety of cleaning service that will make sure to bring satisfaction to your needs. Call us today for more inquiries and details. And we’ll be happy to serve.